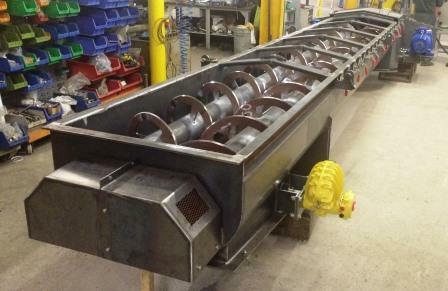 Solids handling specialist Ajax Equipment has supplied leading chemicals producer, Tata Chemicals Europe, with a twin screw feeder, replacing an existing Ajax twin screw feeder that performed reliably for over 15 years. Tata Chemicals Europe produces a range of chemicals for the manufacturing, pharmaceutical, and food industries. The feeder is used in the production of soda ash at Tata Chemicals’ Lostock plant. The Ajax screw feeder provides a link in production between the centrifuge and fluidized bed dryer. Using a twin screw arrangement with a special outlet provides an evenly distributed feed into the fluid bed. The twin screw feeder is constructed from carbon steel, while the auger’s ribbon flights are wear-resistant steel. The machine requires hard-wearing materials due to the effects of soda ash production. The feeder also includes an insulated jacket to maintain the process’ desired temperature and prevent condensation. “Having worked with Ajax on and seen the benefits of the previous twin screw feeder it was an easy choice to work with them on the new machine. Ajax’s knowledge of materials and how to handle them ensures our twin screw feeder is a strong link in the production line,” said Martin Philips, senior project engineer - Lostock, Tata Chemicals Europe.